Fairy fun in magical full colour. 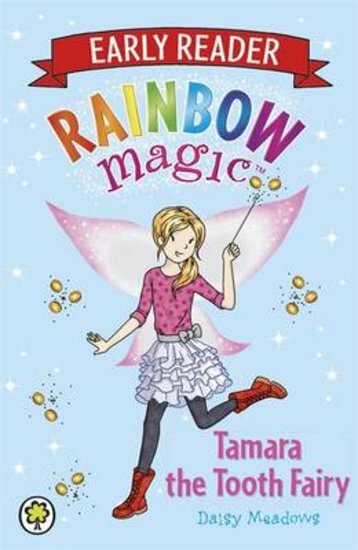 Read Tamara’s tale all by yourself. It’s full of brilliant smiles. You probably think Jack Frost, the mean old Rainbow Magic baddie, is a big scary villain. But here’s a secret: he’s also a big scaredy-cat. When Jack Frost gets toothache, he’s afraid to go to the dentist. Instead, he steals Tamara’s magical fairy items! Can Tamara help him see that the dentist isn’t scary at all, so he can fix his sore mouth? Psst: if you have a loose tooth, don’t forget to leave it under your pillow for Tamara! New book lots of imaginative words and good for kids about to lose their first tooth.